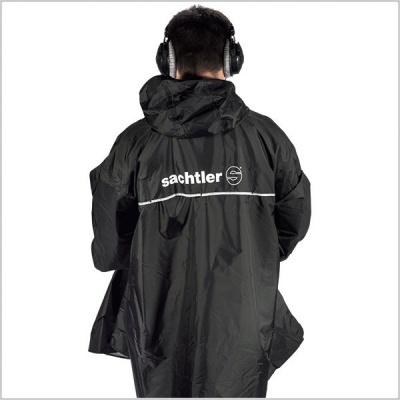 Ultimate weather protection for the working sound professional. The poncho is sized to cover a user and allows freedom of air to circulate to keep equipment cool. 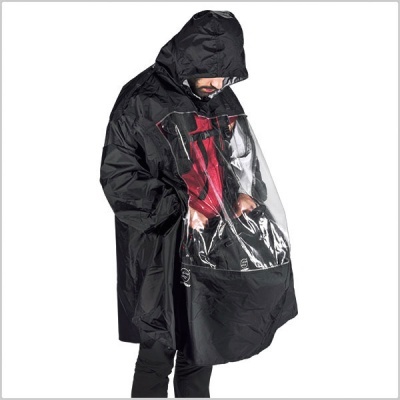 Designed to cover the user carrying mixer and fully loaded Eargonizer bag. Constructed of 420 denier black ripstop nylon, laminated with thin Thermoplastic Polyurethane (TPU) coating that provides greater elasticity and prevents water seeping through. Lighter fabric keeps the user cool and comfortable. "Tile-style" opening at the back allows fresh air to flow inside to prevent over-heating. Front section made of transparent TPU for maximum visibility of working equipment. Slotted "pass-through" hand openings on either side marked with white binding to facilitate quicker and easier access to equipment controls. Long roomy sleeves provide freedom of motion to hold boom pole or other gear at arm's length and still keep mixer and equipment bag safe and dry. Fits into handy drawstring net mesh pouch for easy storage and transportation.